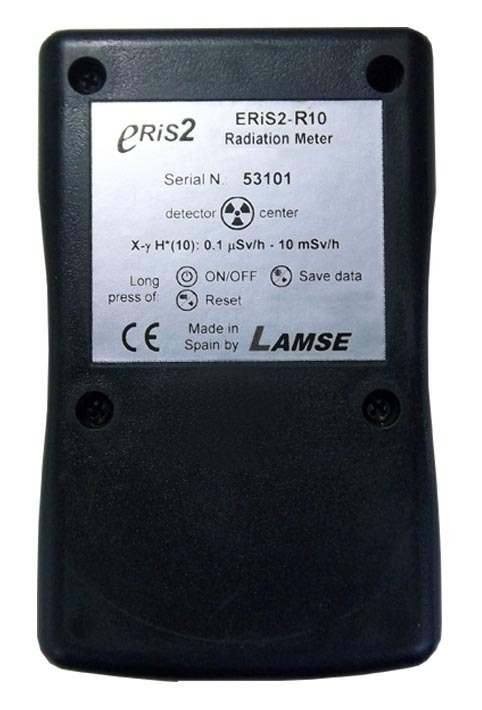 The ERiS2-R is a small and light-weight meter for detecting and measuring of gamma and X-Rays radiation. Compact instrument, of reduced dimensions and only 220 g. Data memory. 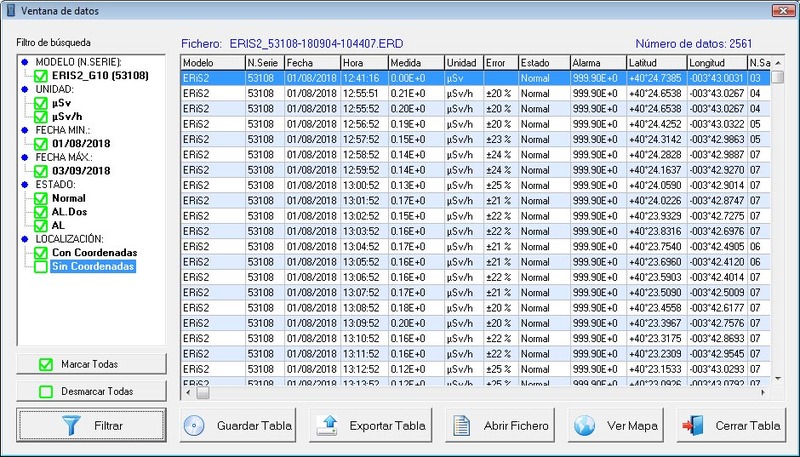 Manual and automatic recording of measurement values, with date, time, parameters, etc. Stable measurement combined with rapid response to a sudden variation of the radiation field greater than 3 times the standard deviation of the mean value. Auto diagnosis. 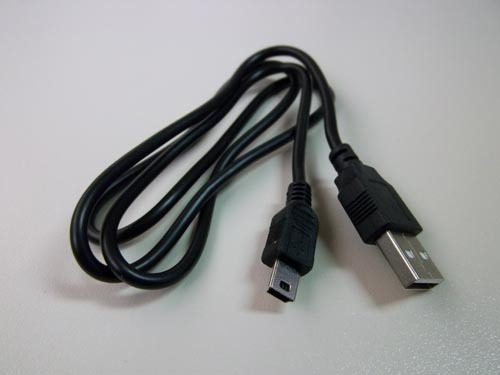 It is delivered with a carrying case type shoulder bag, USB cable, software, user manual and certificate of manufacturer calibration. 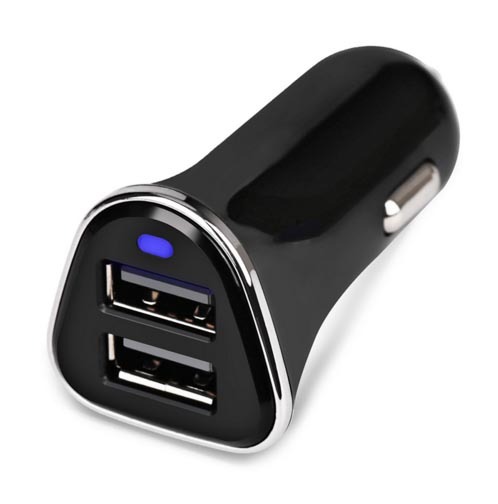 Optional accessories include a charger to connect to the vehicle, etc. 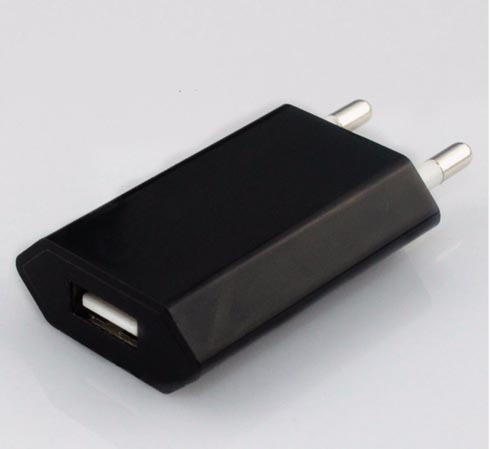 The ERiS2-R10 and ERiS2-R100 are an evolution of the Eris1R model. 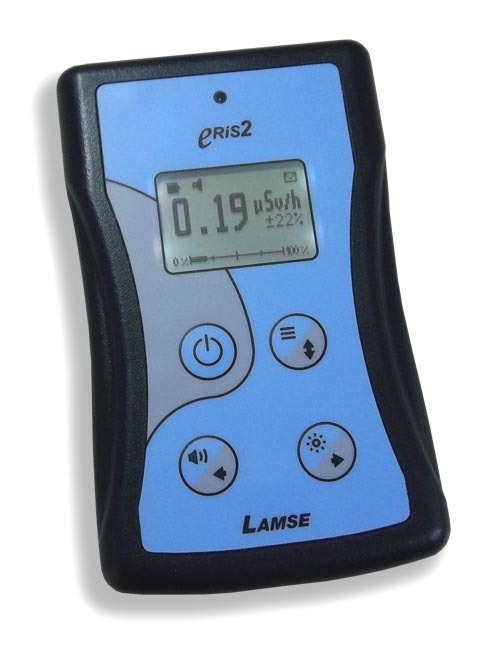 Specifically the ERiS2-R100 has the same detector, therefore of the same sensitivity and range of measurement up to 100 mSv/h than the Eris1R. In addition, there is another model, the ERiS2-R10, which has a detector with more sensitivity but with a maximum range of 10 mSv/h. 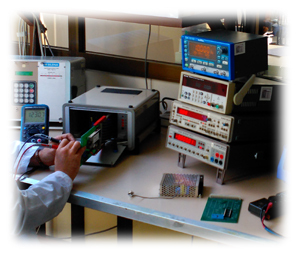 A complex calculation system performs all the necessary operations for the conversion of the detected events to the scientific unit (µSv/h, µSv) that the user selects by applying the corresponding factors. In addition, automatically applies the dead time correction characteristic of the Geiger detectors. 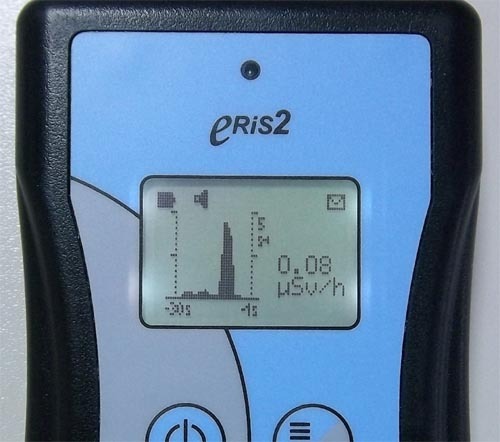 The ERiS2 continuously checks the alarm levels, the battery level, the status of the detector, etc., immediately notifying any incident or anomaly. 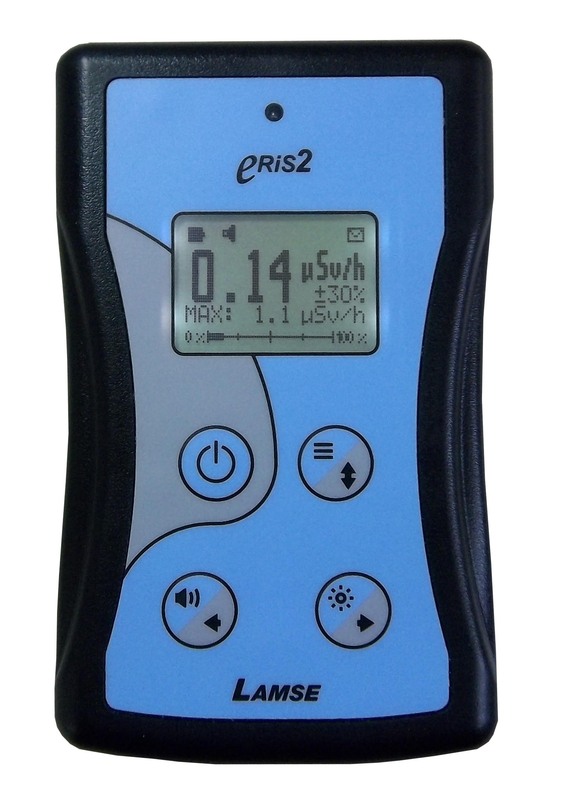 The ERiS2 allows different types of measurement depending on the application. 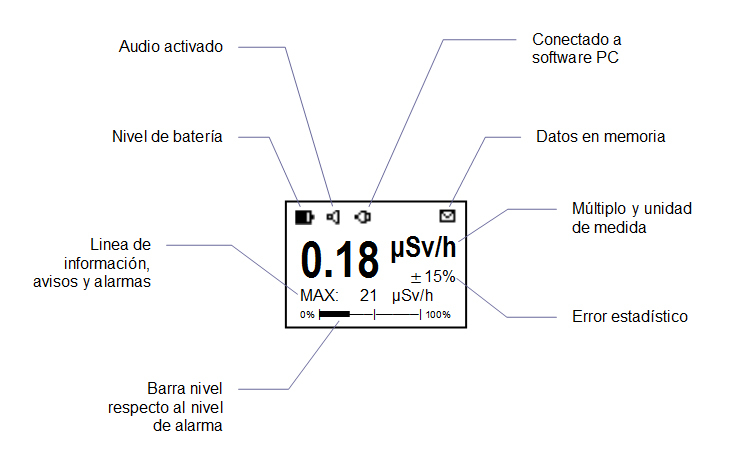 The rate mode has a dynamic time constant, that is, the counting time is fixed as long as the standard deviation of the mean is not exceeded 3 times, in which case, an automatic update of the measurement will occur. This makes the measurements are stable but in case the level of radiation changes, the response of the instrument will be fast. Another interesting function is the search function, which shows a graph indicating the pulses detected with a small time constant of 5 seconds, in such that it allows to see intuitively the detected events. 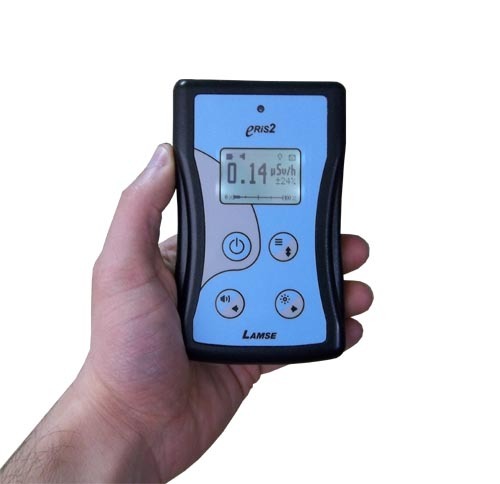 The ERiS2 allows to save the measurement values , which include the date, time, measurements, unit, etc.. 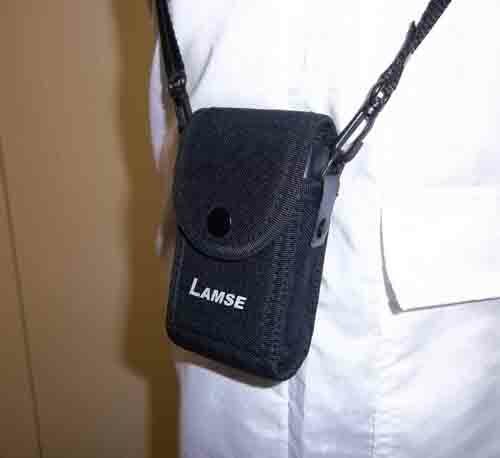 The recording can be manually, or automatically with configurable sampling times. A simple software allows the loading and storage of data on a PC. Memory	 Record of date, time, measurement, parameters, status, etc. Selection of manual, automatic or timer. Capacity for approx. 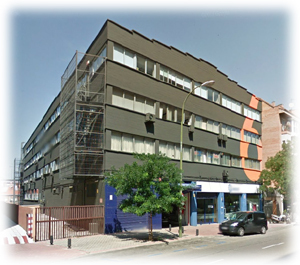 8000 memory locations. 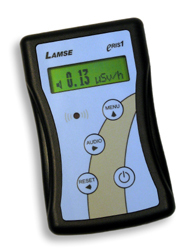 Measurement units	 rate (µSv/h, mSv/h) and accumulated dose witn accumulated time. (related to Cs137)	 max deviation ± 20% in the optimal energy range (relative to Cs137).